Anyone who follows me on Twitter knows all too well how big a tea-drinker I am. Not just basic orange pekoe, but all kinds. I’m always on the lookout for new flavours. And I thought what better place to share my thoughts on the wonderful teas I try than here? Tea and books go together like… tea and books! So every week, on Tuesday, I’m going to take a look at a different tea, and share it all with you. Today in my mug, I’ve got some Bubbie’s Baklava, from David’s Tea. Now sadly this seems to be a discontinued flavour, which means once my little sample container is gone, I won’t be able to get my hands on any more, and that’s a real disappointment because it’s really tasty. 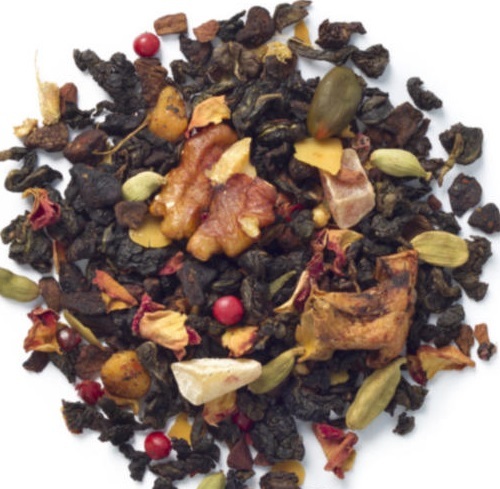 In addition to its base of oolong tea, it has a variety of fruits and nuts mixed in, giving it a really warm spicy that doesn’t quite smell like any baklava I’ve tried, but it does smell like it’d be amazing in a pastry either way. Ginger, cinnamon, and cardamom provide that warmth of scent. As for flavour, you do get the nice warmth of the spices that I mentioned earlier, with some hints of sweetness from the dried fruit. But what comes across in the aftertaste is a weird slight bitterness that I think comes from the nuts, especially the walnuts. I personally find this is balanced out really nicely by a bit of sugar, though it would probably be fantastic with the rich mellowness of honey instead. Either way, something sweet helps cut down on the bitter aftertaste. Definitely no milk required. Milk would just ruin this tea, I think. It’s made to be drunk with just a bit of added sweetness and nothing more. Bubbie’s Baklava is the kind of tea that perfectly complements a chilly fall night with a relaxing homelike scent. A good companion to some comfort reading!